When I was a kid, my mother used to tell me the story of Bhasmasura, a Rakshasa (demon) who was granted a boon by Lord Shiva that he could turn anyone into ashes by simply placing his hand on the head of his victim. Bhasmasura was evil by nature and he decided to test the efficacy of the said blessing by placing his hand on the head of his benefactor Shiva himself! Seeing no other respite, Shiva sought Vishnu’s assistance. Vishnu took the form of an enchanting apsara called Mohini and lured the demon into following her dance steps. While dancing, she strategically placed her hand on her head. Bhasmasura, who was smitten by Mohini’s beauty forgot the boon and blindly followed her step by placing his blessed (read, cursed) hand on his own head, and was immediately burnt alive. Moral of the story : Nothing is immortal. The moment God creates something, he also devises the method of its destruction. I used to love this story. The strong devil falling prey to his own might delighted me immensely and I always thought that it was one of the best Puranic story I have ever heard. However, little did I know that my favorite story had influenced my favorite writer as well. As I read The Man Eater of Malgudi, I came to know that R.K. Narayan, inspired by the above story has successfully constructed a modern Bhasmasura, named him Vasu of Junagadh, gave him immense power and pride and a fiendish nature. He made the lives of his benefactors, friends and adversaries a living hell, but was at last doomed by his own antics. Nobody other than Narayan could have restructured the age old story in a modern avatar. He set the story in Malgudi, where lived Nataraj, a simple social man, who owned a small press. Nataraj is a typical Malgudian, content with his humdrum life and modest earnings, and lazy enough to handover complex printing jobs to his neighbor. A small part of his printing press literally serves as a community center, where poet composed hymns and his journalist friend fiercely debated the reason for the failure of Nehru’s policies. Not just his friends, but even his employee Sastri and his customers including Adjournment Lawyer and Juice Vendor take Nataraj for granted. He is too mild to object the unwarranted use of his press, too servile to boss around and a bit too reluctant to demand his own dues. It is inevitable for such a man to suffer in the longer run, and in the present novel, his downfall was brought sooner than later, by the entry of a typhoon in his press, with a grand name of Vasu of Junagadh. Vasu is a taxidermist, more than a profession, it is a passion with him. He takes pleasure in skinning and stuffing wild animals, replacing their bright lively eyes, with his artificial stony stare. As one can readily see, he is the exact opposite of Nataraj. However, for some strange reasons, he takes special interest in Nataraj, and before the former could take stock of the situation, Vasu had occupied the attic above the press. He intruded as an imposing stranger and settled as a non-paying tenant. When Nataraj finally realizes that he has landed himself in a booby trap and tries to distance himself from Vasu, he is slapped with a legal notice. Will Nataraj ever be able to get rid of Vasu? Will he be successful in saving the sanctity of his press and the life of Kumar the temple elephant? Or will Nataraj’s generosity create a storm in the serene Malgudi? These and many such questions are answered in the 256 pages of the present novel, The Man Eater of Malgudi. As I finished this novel, I realized that it is Narayan’s first book in which I have encountered a totally negative character. Be it Mali of Vendor of Sweets or Raju of Guide, Narayan always created positive characters, who may at times do bad karmas, but are never wholly evil. His characters usually fall in fair or grey shade, but in the present novel, he has created a pure black persona. Vasu is absolutely devoid of emotions, a vicious man who does not think twice before killing someone. In fact, the title aptly suits the character of Vasu. He is scarcely a man, Man Eater would be a better word to describe him. And, I can say with conviction, that it is the story of Vasu, the man eater, who entered Malgudi in a disguise and robbed it of its serenity. However, Vasu’s strength and prominence does not take away the focus from Nataraj. In the beginning, I found him to be a likeable man, who is more worried about his goodwill and social status, than earning a decent wage. With Vasu’s entrance, his naivete in trusting a stranger was revealed. But, as the story progressed, I found that Narayan has created Nataraj as a perfect foil for Vasu. If Vasu is guileless, Nataraj is spineless! He is unable to restrict Vasu from entering his premises, and yet hesitates in taking legal recourse for the fear of spoiling his friendship with the later! He is simply not capable of differentiating between friendship and slavery. His weakness of physique and mind is exposed, when instead of taking Police help in nabbing Vasu, he simply sits at home, fidgeting about the fate of Kumar. Even as a husband, he has little understanding with his wife and child, and despite his vehement denial, he is suspected by his wife to have illegitimate relations with Rangi. And, worst of all, when he is surmised to be Vasu’s murderer, he does nothing to allay the doubts, and in fact by gifting the stuffed tiger cub to the poet, he further increases his probability of being labeled as the culprit. So, in a way, Man Eater of Malgudi is a story of excesses. Extreme characters have been created, portraying one as the epitome of evil and the other as the height of gullibility. However, Narayan’s novel can never remain all sombre and dry. His streak of humor gets evident at regular intervals, and here the climax produced a much more comic effect than I had seen in his previous novels, and it was sheer pleasure to devour 256 pages of pure entertainment. Another unique feature of the novel is that it has a definite end. All the mysteries are solved, and Malgudi’s life is restored to the normalcy. In the beginning of the novel, I had felt a bit disgusted at the detailed explanation of hunting expeditions and the unsentimental descriptions of skinning and stuffing of animals. I had read similar passages in War and Peace and Anna Karenina as well, and somehow had accepted them as a necessary evil of aristocratic society. However, I was saddened to find such details being part of the idyllic Malgudi life. However, at the end, the animals were vindicated as an Asura fell prey to the tricks of destiny, and I realized that possibly the earlier episodes were written with the express view of creating a detested character. 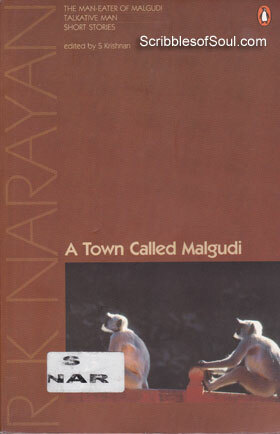 In all, it is a wonderful beginning for the collection ‘A Town Called Malgudi’ and different from all other works of R.K. Narayan, doing full justice to the anecdote of Bhasmasura. Sorry for publishing your review in my blog. I learnt that you visited the blog. you must have seen i am blogging for literature students and my purpose was to make notes available at one place. i never intended to claim this writing as mine. You are most welcome to refer to our reviews, by linking to them. However republishing them on your own blog, isn’t the right approach.